In May I traveled to the Big Island of Hawaii for a week long vacation and there were 2 things I was most looking forward to: scuba diving with the Manta Rays and seeing hot scalding lava. The trip delivered everything and more! A lot of back and forth decisions finally led my friends and I to sign up for an evening lava tour with Kalapani Cultural Tours. The hike out to the lava wasn’t too bad — about 2 miles along mostly flat lava. Our guides LOVED to talk about the lava but unfortunately they couldn’t seem to do it while we walked. We spent so much time stopped ’resting’ that our arrival time started getting dangerously close to the best light. At first we came upon the surface flow — where some of the lava had bubbled over and began to creep along the surface. 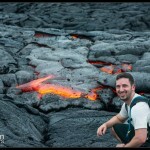 After taking my picture 2 feet away from 2,000 degree lava I decided I wanted to go see the ocean flow. The lava conditions change every day. A lava bench that was around yesterday may have fallen off and will be completely gone the next morning. When I arrived there was no safe viewing spot close up to the lava. 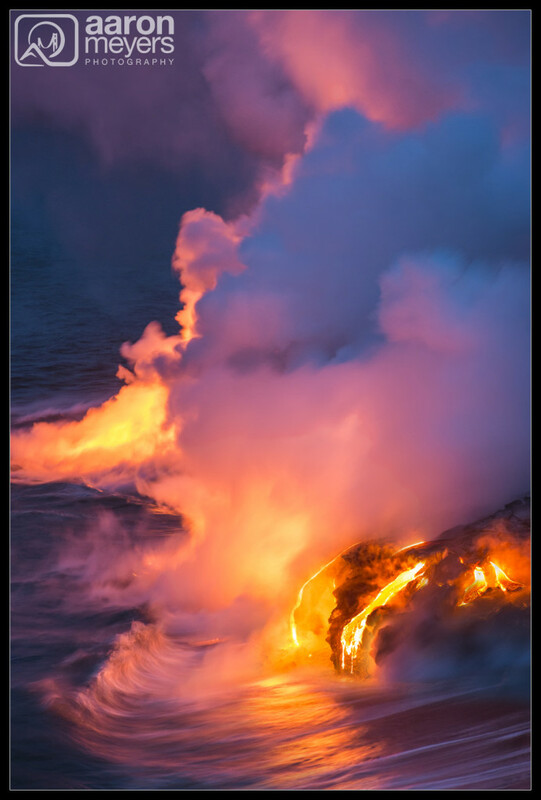 I had to stay far back, high on a cliff, and used the 80-200mm telephoto to get nice and intimate with the lava. On this evening the lava was flowing so fast that there was a TON of steam everywhere. More steam than I would have liked. 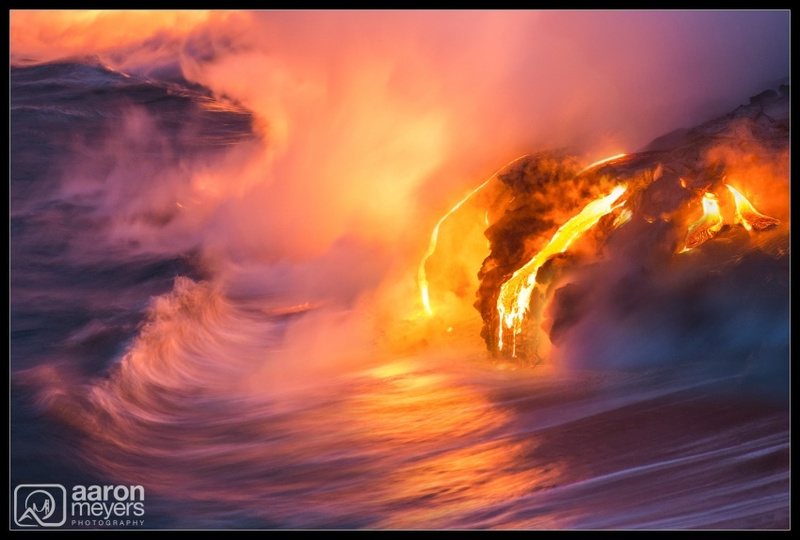 As we watched the sun set, 2 new streams of lava broke through the tube and made their way down into the ocean. You can see them on the far right of the photo. This photo was cropped from a portrait orientation. I thought I would also share my original thought process with you. Which do you like better?